I dropped the 6-year-old to school and I walked home with the small boy; like we always do. Yesterday I had to nip into the Supermarket for some messages on the way and my heart sank. Right at the front door there was floor to ceiling displays of sweets and chocolate based on a Hallowe’en theme. It was a couple of metres long and I have to walk past it to get to the fresh fruit and vegetables. Couple that with the massive aisle ends of chocolate (most popular brand in Ireland), also of fizzy drinks, and the cash register gauntlet of sweets and chocolate it’s difficult to say no. My boys know not to ask, but it’s not that easy for everybody. The journey home brings us past 3 different chip-shops. We live in the most takeaway oriented town in Ireland, with as many as 1 takeaway for every 1,000 people who live here. There are bags of chips for €1 in every single chip-shop during the day, the price rises in the evening. Daytime custom is mainly parents with small children and teens on their lunchbreak. Why buy a sambo when you can have a bag of chips laden with salt and vinegar for €1? Feed your family well for less? Why bother when you can pick up a couple of bags of hot chips that you don’t have to cook at the same price of a family meal? No plates to wash, no pots to wash, no slaving over a hot stove, just pop the brown paper bags in the bin when you’re done. The smell. Oh sweet mother of divine. The smell of hot chips with warm vinegar wafting from the chipper as I walk past. There’s eating and drinking in it. Later I nipped down to the allotment with the 2-year-old for a while. My father-in-law has a glut that I’m “helping” him with. Read that as I’m taking home vegetables to cook/steam and freeze for the winter. I realise how lucky I am and how most people can’t do this. Since we started growing our own food I’ve been living in two worlds. The world where I pay for items in the shop with temptation, and the one where food is homegrown and reared, wholesome, healthy and without pesticides or any other nasties. My counter is groaning under the weight of tomatoes, carrots, cabbages, broccoli, courgettes and onions at the moment. Thanks in no small part to the glut on my father-in-law’s allotment. Over on our own allotment we are digging over empty raised beds in preparation for a cosy covering of manure for the winter. There are wonderful small things sprouting away in the polytunnel so that we will have our own vegetables to pick fresh on Christmas Day. We’ll also have our own ham. In fact I think the only thing not from the allotment will be the turkey. The 2-year-old is thriving on the outdoor life. 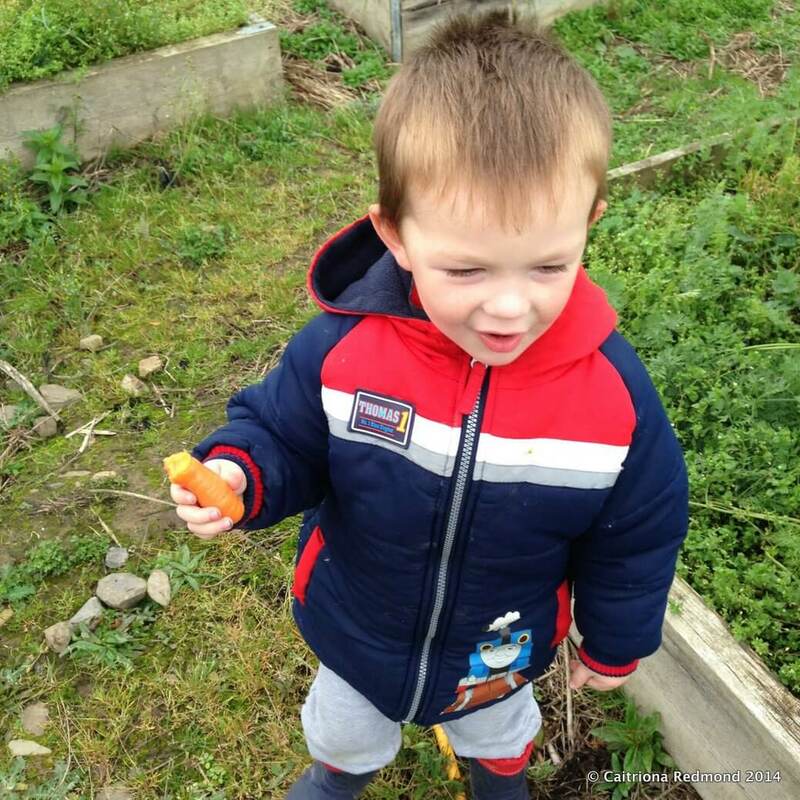 He loves nothing better than pulling on his wellie boots and dragging his toy tractor up and down the allotment. He was pleased as punch to help me out picking tomatoes yesterday. Granted he wouldn’t eat them straight from the vine but he is a big fan of my sauce so I’m happy enough with that. 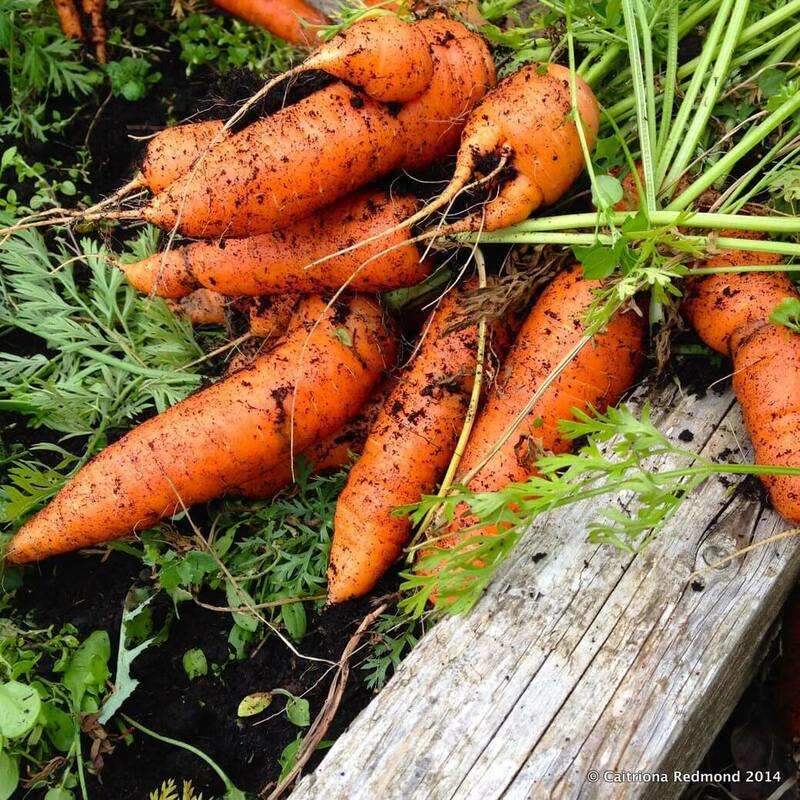 We got handfuls of carrots in the morning. Massive big bunches that I’ll scrub, steam and pack away into the deep freeze. The wee man insisted on me “opening” (topping, tailing and cleaning) some for him while we were down there and picnicked on carrots that had been in the ground moments before. There was a wonderful crunching sound as he chomped away, supervising the adults working away. When carrots are that fresh there is no need to peel them. That’s the growing world that I love so much. That’s miles better than chips, even though the smell gets me everytime. The smile and the joy through a 2-year-old’s eyes makes my heart sing. If you’re looking for me I’m in the kitchen, scrubbing, steaming, cooling and freezing. Huge thanks to my father-in-law for donating his allotment glut to the freezer and to Rory from Eat Drink Run Fun who arrived last night with an electric steamer to help me out.